This is a guest post contributed by Fish Ip, the regional coordinator for Asia for the International Domestic Worker’s Federation (IDWF). Sabina Khatun is a 14 year old domestic worker working with the Beri family in Haryana, India. She was found dead on 24 January 2014 in her employer’s residence. It took Sabina’s family three years to get the forensics lab analysis report. It proved that a sexual act/assault was committed against Sabina by a man who might be the family driver, Om Prakash, and the younger son of the family, Apoorva Beri. Both men have fled out of the country. It’s been five year, and no one has been arrested and penalized. The case of Sabina is the tip of the iceberg. Similar to other domestic workers, Sabina worked behind closed doors. They have little power to negotiate for rights: imagine you are a woman, or an underage girl, from a marginalized community. You come from a poor family. You may come from a rural village. You may be someone from an ethnic minority or lower castes. You may be a migrant woman whose visa is tied to your sponsoring employer. You cannot change employers without your sponsor’s consent. If you run away from abuses, you become an illegal person. You fear deportation if you make complaints. You cannot easily speak out and seek help from violence and abuse. 3.84 million domestic workers are under forced labour situations according to the ILO estimates. The ILO estimates that there are at least 67 million domestic workers who are over the age of 15 in the world. 83% of domestic workers are women. They are vulnerable to gender-based violence. 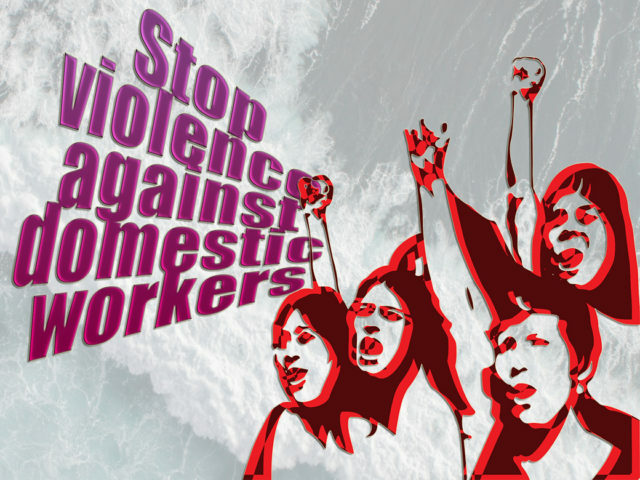 As explained by Myrtle Witbooi, the president of the International Domestic Workers Federation (IDWF), “Gender-based violence has been a silent killer of many domestic workers around the world, as we are scared to speak out, afraid of losing our jobs.” They face various types of gender-based violence. In a survey done by the IDWF with its affiliates in Asia, the most prevalent types of GBV experienced by members are financial and economic abuse. Psychological abuse, sexual harassment, verbal abuse and eating poor quality of food are other common abuse they face. Besides these, bullying, coercion, the lack of privacy for live-in domestic workers are comparatively less prevalent but equally alarming. Many cases of abuse is simply inconceivable but real. A domestic worker reported that she was made to sleep on the top of a washing machine in the kitchen. Adelina Lisao, aged 21, was found dead lying with a family dog at the porch of her employer’s house. She died of organ failure. A Singaporean couple, Tay Wee Kiat and Chia Yun Ling, found guilty with ten charges of abuses against their domestic workers. Some violence is detrimental to the workers’ psychological and mental health. They forced their domestic workers, one Muslim and one Christian, to slap each other and bow in front of a Buddhist altar. “Psychological abuse, in conjunction with physical harm, is what characterizes egregious instances of maid abuse and makes them especially abhorrent”, Justice See Kee Oon, the Supreme Court judge said in his judgement of the case. To stop this violence, governments and the public must take action to break the isolation of domestic workers .The ILO convention 189 Decent Work for Domestic Workers (C189), adopted in 2011, is a landmark to illustrate that domestic workers are workers. They should enjoy the same rights with the other workers. Article 5 says “Each Member shall take measures to ensure that domestic workers enjoy effective protection against all forms of abuse, harassment and violence.” Governments should lay out laws and policies that are tailored to the special characteristics of domestic work – private households where domestic workers are working are workplaces and should be monitored. The IDWF has been campaigning for the ratifications of C189 by the governments. In addition to this, the current ILO process of drafting an international labour instrument on “Ending Violence and Harassment in the World of Work” opens up an incredible opportunity for domestic workers, alongside with other women, to address the issue. In June this year at the International Labour Conference, governments, employers and workers will finalize the form and content of the instrument. If there will be a Convention on “Ending Violence and Harassment in the World of Work”, ratifying countries should ensure its laws and policies follow the Convention. It is time for us to ensure the adoption of a Convention and its articles to be clear and strong enough to ensure eradication of violence and harassment in the world of work. The Convention should recognize all types of violence and harassment with specific and strong reference to gender-based violence and harassment. Domestic violence does affect work and should be included in the clauses. Private homes are workplaces for domestic workers. They also commute to work and go to markets to buy food for employers. Public spaces should be within the scope of the world of work. There are multiple perpetrators of gender-based violence in the case of domestic workers. Not only the direct employers, but the relatives and friends of the employers, employment agencies and intermediaries, government officers and the police should all be held responsible. Workers have to be able to speak up and be organized to make changes. The IDWF, together with its 69 affiliates from 55 countries around the world, is committed to fighting for the adoption of the Convention on “Ending Violence and Harassment in the World of Work” and its ratifications afterwards. We conducted training and awareness raising programs on understanding gender-based violence. Our affiliates, together with unions and women organizations, are lobbying governments and employers to support the adoption of the Convention. The IDWF also engages employers and the public in its My Fair Home Campaign – we need a global voice, support and hands joining together “to actively ensure a work environment that is free from abuse, harassment and violence”. It is now 2019, and the fight for justice for Sabina has been going on for five years now. The IDWF together with its affiliate, the Gharelu Kamgaar Sangathan (GKS), and the network groups in India are still working on the court proceedings and advocacy. The world owes justice to Sabina and millions of domestic workers.